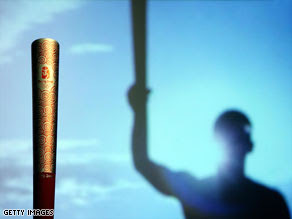 Yesterday afternoon, I saw on CNN that the seventh stop for the Olympic torch relay was held in London. As the torch relay progressed, protestors suddenly appeared and tried many times to disrupt the occasion. Protestors were successful in turning the torch fire off by using a fire extinguisher and grabbing the Olympic torch. Torch relay organizers opted to place the Olympic torch in a bus to guard it from protestors. Protestors are by the way from Tibet and were protesting against China’s crackdown against them. The Olympic torch lighting marks the countdown of the opening of Olympics. According to Wikipedia, “The Olympic Torch is based on traditional scrolls and uses a traditional Chinese design known as "Lucky Cloud". The torch is designed to remain lit in 65 kilometer-an-hour winds, and in rain of up to 50 millimeters-an-hour. It is designed by a team from Lenovo Group. The Torch is designed in reference to the traditional Chinese concept of the 5 elements that make up the entire universe.” The relay will cover 85,000 miles over 23 cities in 34 days until they reach Mainland China. 2008 Summer Olympics will open on August 8, 2008 in Beijing, China. You know maybe the person trying to put the torch out had a point. I've just finished reading another blog ( http://www.teniabaker.com/blog/2008/04/08/health-safety-problem-of-olympic-proportions/ ) which suggests that it was against UK Health & Safety laws! I dont think the protesters were from Tibet itself, I think they are local folks protesting against China's hosting of the games because of it's bad human rights record. thanks for posting this kind of info.. I really enjoy reading your blog..